More real estate ads | Makiko Itoh : Not a nameless cat. The fun thing about house hunting in Europe is that you run into all kinds of fascinating old places. You don't really get that in the U.S., or in Japan either, where people tend to knock down houses and rebuild (the land is the important thing there, not the house). It only comes with 300 square meters of land, which is a drawback (a big house like this deserves at least an acre or 10), but it has 7 bedrooms, original features galore inside, ramparts and amazing views of the surrounding vineyards. The original ad here. Of course it does cost 890,000 euros, and would probably take at least half that amount in addition to renovate it properly. Still, the fact that a normal person with deep enough pockets can actually buy such a thing is pretty mind boggling. Amazing! You are absolutely correct whebn you say we don't get this type of property in the United States. I've been in the American real estate business for over 15 years now. And I must admit, I envy the gorgeous properties that Europe has to offer. wonder how long this house will remain on the market? 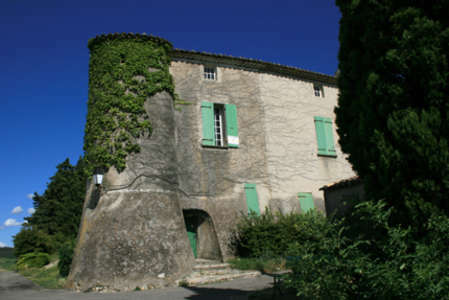 At 890,000 euros, the potential buyers for a place like that might be a little limited. Although there's always someone out there for every property. Won't need to worry about termites in that building. Plus houses in Europe last much longer than 50 years like here. I wonder what it would cost to dis-assemble and bring to U.S. to place on a larger piece of property. A castle deserves an estate! As someone who also has a "thing" for the Knights Templar, I can understand your mother's lust for this home. It is beautiful. Switzerland was founded/conquered from 3 isolated medieval provinces in that zone by one Knights Templar exiled branch right after they were betrayed and persecuted by the greedy King of France. It was a geographical zone they knew well from their land travels to the crusades, a good mountain maze to hide, regroup and defend with ease. The timing was also perfect because when the Knights Templar started their exodus there were peasants revolts in that zone against the nobility ruling these 3 fiefdoms, so they just had to hide with the revel army and (of course coming from the elite troops they were) wipe out any opposing force, taking the place as the new rulers... since then. Also whats the point of your mother's thing with the Templar? because I'm sure somebody using a double edged two handed sword can't be a bad dude, word. O_O That is like the ultimate dream house! Though I think I'd have to fight my mother for it, she's got a thing for the Knights Templar. Wow, that's a really interesting looking home/castle.